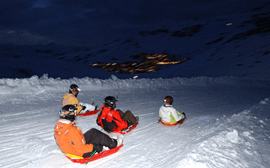 Val Thorens Toboggan, the Best time of your Lives! A MUST! More people = greater fun! 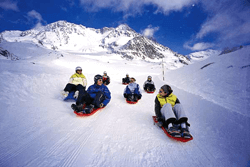 Val Thorens is very lucky as it has the longest toboggan course in France. It is 6km long and there are some quite steep sections so even ‘Mr Cool’ will get a little scared! It starts at an altitude of 3000m and drops 700 vertical metres, which is quite a lot. Normally lots of crashes happen and even more laughs, this is really good fun and very highly recommended. Go with as many people as possible to make it more fun. To enjoy the Toboggan it costs 18€ per go, but if you already have a lift pass it is reduced to 12€ (make sure you bring your lift pass with you). They provide a sledge and a helmet, however, if you already have a ski helmet (if you don’t WHY NOT!) bring it with you as theirs can get a little sweaty. If this is not tough enough for you, well why not try it in the dark?! Yep they do evening sledding between 5pm-6pm, in December and January it is quite dark at that time. There is also a price reduction if you go more than once. Beware it is a lot lot faster if it hasn’t snowed for a while as the snow is more hard packed! Val Thorens also has a baby version of the Toboggan, this is located at Place de Caron (just outside Tourist Office) and is for kids from 2 years old to 6 years old. This has been here now for many years but in 2010 the resort made it much much better. Additionally, they have also added another Toboggan run from the Place de Caron for 6-10 year olds, this has some twists and turns and drops 45m vertical. Both runs are completely free and you do not need a lift pass as you use the free carpet lift. If you are a non-skier Val Thorens offers a non-skiers lift pass which includes lots of non-skiing activities which Tobogganing is one. Click on the Val Thorens lift pass page. If you want to see exactly how it is before you try yourself, we found this YouTube video of a group of friends enjoying it!